Supporters of the EU talk a lot about the impact on trade of leaving the EU. They tell us that leaving the EU will be devastating for trade and cost 3 million jobs. This claim is simply based on just under 10% of our trade being done with the EU, an assumption that just under 10% of of jobs are therefore linked to trade with the EU and a ridiculous assumption that leaving the EU will mean ending all trade with the EU and therefore making those jobs redundant. The idea that we would cease all trade with the EU when we leave is just preposterous and there is no evidence of any correlation between the percentage of trade we do with the EU and the number of jobs in the economy. These jobs (whatever the number really is) rely on trading with the EU, not being a member of the EU. Almost every country in the world trades with the EU and almost all of them are not members of the EU. Let's just put these claims about trade into perspective shall we? 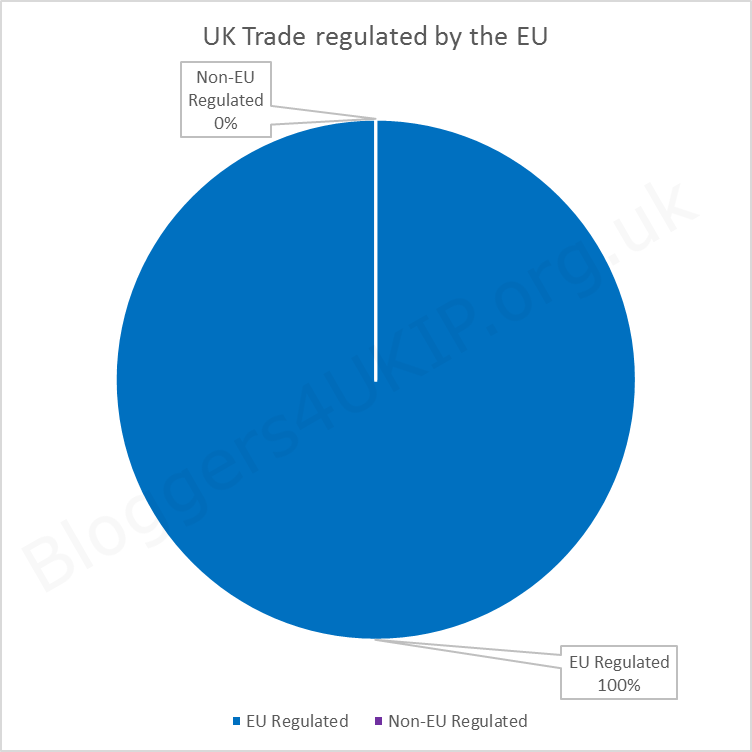 How much of the UK's trade is actually done with the EU? Listening to the Remainians you'd think it was most of it but it's not. 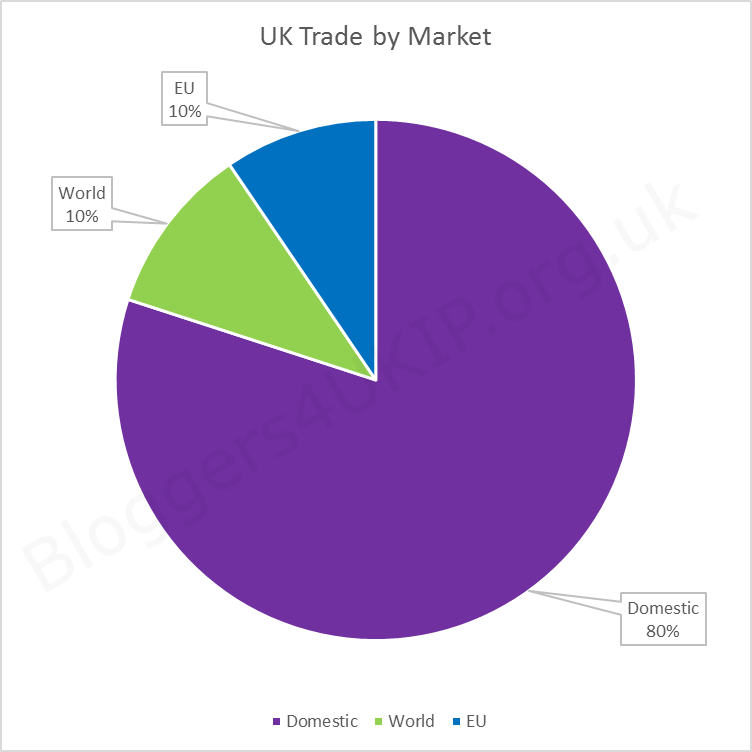 Less than 10% of trade carried out in the UK is with an EU member state, just over 10% is carried out with non-EU countries around the world and a little over 80% of trade in the UK is domestic trade carried out within the UK. 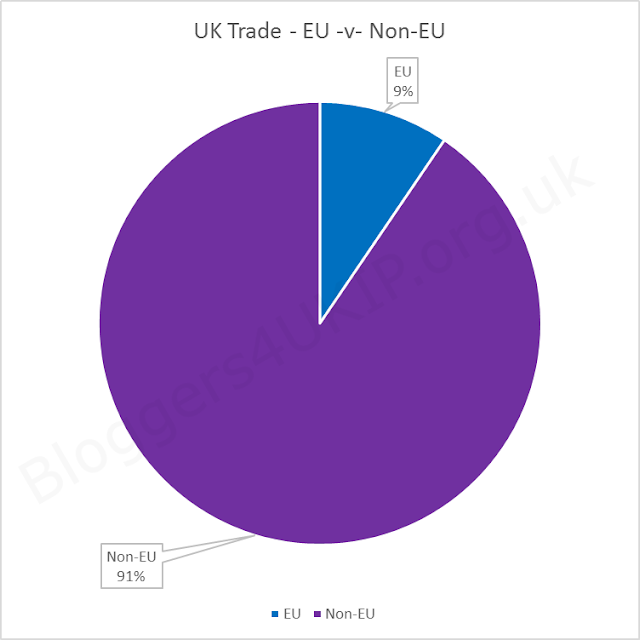 So only about 9% of trade carried out in the UK is with EU countries and the other 91% is either domestic trade or with the rest of the world outside of the EU. The impact of the laughably implausible scenario of all trade with the EU ending two years after our referendum is not insignificant but we're talking 9% of trade, not 90%. In the incredibly unlikely event that the EU stops trading with its largest export market - that's us if you didn't know and it's something that literally nobody but Guardian readers believe would happen - then we're talking about 9% of all trade carried out in the UK as it stands now without the increased trade from being able to trade freely with the rest of the world again. So whilst trading with the EU is important and of course serious curtailment of trade with the EU (which would be illegal under WTO and EU rules) would have a negative impact on the economy, what about the benefits of not being shackled to the red tape machine that is the EU Commission? Being able to retake our seat on the World Trade Organisation would be a positive, obviously. Free trade agreements with the world's largest and fastest growing economies would of course be another huge positive. But remember that over 80% of our trade is with ourselves where free trade agreements and import duties are irrelevant. The biggest difference leaving the EU will make on our day to day lives is that the 91% of our trade that's conducted outside of the EU won't be regulated and restricted by the EU. When we vote to leave we can do away with EU tariffs on energy saving lightbulbs that were imposed to protect german manufacturers from cheaper Chinese imports. Nor will we pay through the nose for "cheap" shoes because of EU tariffs imposed to protect Italian cobblers. We will be allowed to eat bendy (or straight) bananas and square strawberries. We won't have to cover the cost of the EU's carbon trading scam scheme through our energy bills. In other words, we will be free from the kind of clueless, self-perpetuating bureaucracy that can spend 6 months investigating the safe quantity of wine gums a lorry driver can eat before discovering to their utter amazement that wine gums don't actually contain any alcohol. By drafting in big business to fight on the side of Project Fear, David Cameron and his cronies are playing a very dangerous game. They are backing these companies into a corner where they will be forced to react negatively to a leave vote to save face, having told the world that the UK outside of the EU will be bad for business. Investors aren't going to have faith in the board of a London-based company that predicts the collapse of their business when we leave the EU and then after we've voted to leave carries on as if nothing happened. If they can't get that right then what else have they got wrong and while we're at it, why is their investment being risked by using it as a political football? These are the inconvenient questions they will be keen to avoid. The complete lack of planning for a leave vote is another dangerous game. It's sowing uncertainty and it's having a negative impact on the economy. This is deliberate of course because companies and investors like certainty and they're not getting any and what better way to scare people into thinking a leave vote will damage the economy than by sabotaging it while we're still talking about it? Companies and investors want to know that the British government has a plan for life after Brexit but all they're getting is lobbying from ministers and civil servants trying to get them involved in Project Fear. But the most dangerous game of all is talking down our prospects. Having spent the whole referendum campaign telling the world that we can't survive without the EU, he can't then tell the world that the UK is the best place to do business outside of the EU after we've left. In his desperation to make voters think that the world's 5th largest economy can't survive outside of the world's fastest declining economic bloc Cameron is telling the world that we are weak and that they may as well give us a wide berth when we vote to leave. These are not the actions of a capable leader, these are the actions of a desperate man who has staked his political career on this referendum and has no qualms about taking the economy down with him to try and secure the result most likely to keep him in a job.